Point Pleasant second baseman Madilyn Keefer, left, relays a throw to first base as shortstop Peyton Jordan looks on during the third inning of Thursday night’s softball contest against Wayne in Point Pleasant, W.Va.
POINT PLEASANT, W.Va. — Better late than never. 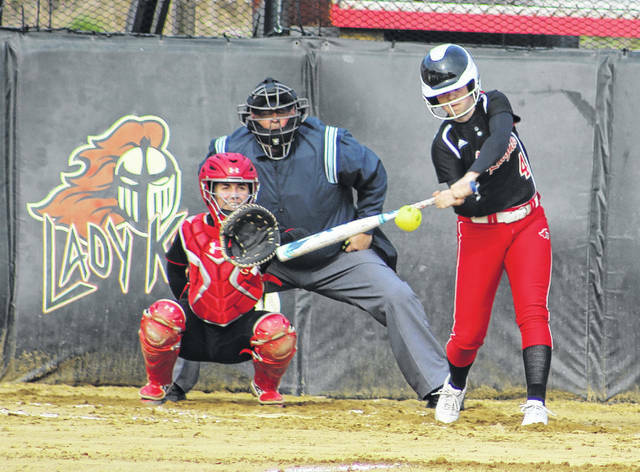 The Point Pleasant softball fought an uphill battle for the better part of six innings, but a four-run explosion in the bottom of the seventh ultimately lifted the hosts to a thrilling 9-8 victory over Wayne on Thursday night in a non-conference contest in Mason County. The Lady Knights (6-3) found themselves deadlocked with the Lady Pioneers (2-2) after the first and third frames, but the guests pulled away from a two-all tie by plating six of the next nine runs en route to an 8-5 cushion through six complete. After holding WHS scoreless in the top half of the seventh, the Lady Knights started their epic comeback in the home half of the seventh as PPHS had three straight batters reach base — leaving them loaded with nobody out and the six-hole hitter coming to the plate. Lila Beattie followed by grounding into a fielder’s choice that led to a force out at the plate, but it also proved to be the final out that Wayne would end up recording. Shala Swain followed with a two-RBI single to center that plated both Leah Cochran and Madilyn Keefer for an 8-7 deficit. Vanessa Clark followed by fouling off three pitches with a full count, then drove a ball to left field that ended up resulting in an error — allowing Clark to reach safely as Beattie scored for an eight-all contest. Hannah Smith drew a walk in the next at-bat to load the bases, then Peyton Jordan provided the heroics with a 2-0 single to right-center, allowing Swain to score the game-winner while giving PPHS its only lead of the night. Wayne took a 1-0 lead in the top of the first as Elizabeth Queen singled home Emily Osborne, but the hosts answered in their half of the first as Cochran doubled in Kelsie Byus for a one-all contest. WHS claimed a 2-1 cushion in the second after Brailey Queen scored on a RBI-double by Riley Parsons, but Point Pleasant countered in the third after Tanner King belted a two-out solo shot to right-center — tying the game at two through three complete. Parsons singled home Olivia Maynard in the fourth for a 3-2 edge, then the Lady Pioneers added two more scores in the fifth as an error and a Maynard RBI gave the guests a 5-2 cushion. PPHS answered in the bottom of the fifth as a Keefer ground out allowed Byus to score for a 5-3 contest after five full frames. 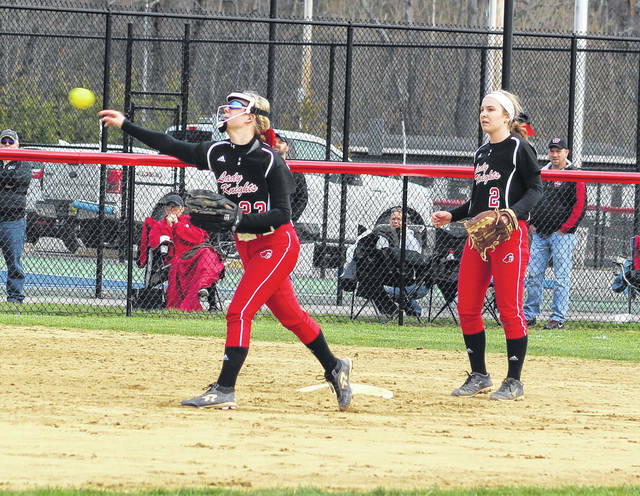 Wayne captured its largest lead of the night after its half of the sixth inning as Elizabeth Queen doubled home both Parsons and Regan Roach, then Elizabeth Queen scored on an error that made it an 8-3 game midway through the sixth. Smith reached on a two-out walk in the sixth, then Jordan hammered a two-run homer to left-center while making it an 8-5 contest headed into the finale. Wayne outhit the hosts by a slim 13-12 overall margin and both teams committed two errors apiece. Each squad also stranded nine runners on base. Keefer ended up picking up the victory after allowing only one hit in one inning of relief work. Whitney Samson took the loss after allowing six runs (three earned), four hits and a walk over 1⅓ innings while fanning one. Swain led the hosts with three hits, followed by Jordan, Byus, King and Cochran with two safeties apiece. Smith completed the winning hit total with a single safety. Jordan paced Point Pleasant with three RBIs and Swain knocked in a pair. Byus led the Lady Knights with two runs scored. Parsons led Wayne with four hits, followed by Elizabeth Queen with three hits and the duo of Roach and Maynard with two safeties apiece. Osborne and Regan Booten also had a hit each for the guests. Elizabeth Queen paced the Lady Pioneers with three RBIs and two runs scored. Parsons also knocked in a pair of scores. Point Pleasant was scheduled to play a doubleheader on Saturday and will return to action Tuesday when it travels to Hartford for a Mason County clash with Wahama at 6 p.m.